US demand for windows and doors is forecast to rise 4.8% annually to $34.3 billion in 2021. One key factor driving growth will be continued strength in new housing and renovation activity, including investment in new and replacement windows and doors. Expanding construction spending in window- and door-intensive commercial segments – specifically office, retail, and lodging structures – will also fuel sales. 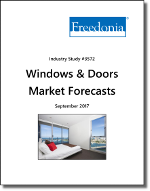 This Freedonia industry study analyzes the $27.2 billion US window and door market. It presents historical demand data (2006, 2011, and 2016) and forecasts for 2021 by material (metal, wood, plastic), market (new residential, residential improvement & repair, new commercial, commercial improvement & repair), product (windows, doors, components & other window & door products), and geographic region (Northeast, Midwest, South, West). The study also evaluates company market share and provides competitive analysis on industry leaders, including Andersen, ASSA ABLOY, JELD-WEN, Marvin Companies, Masonite International, Pella, and Ply Gem. This study examines the US window and door market by product, material, market, and geographic region in value terms at the manufacturers’ level (i.e., excluding the value of features and services added between the manufacturer and end user, including door hanging and finishing operations not offered by the door slab manufacturer). Historical data for 2006, 2011, and 2016 and forecasts for 2021 are presented in US dollars. For the purposes of this study, the value of installed glazing is included in the demand numbers for all window products, with the exception of curtain wall, which includes only the framing materials. Windows with multiple openings (e.g., bay and bow types) that are sold as one unit are considered to be one window. The value of installed glazing, sidelites, and/or transoms is included if sold by the manufacturer as part of the framed system. To avoid double counting, parts and components sold to, or imported by, door manufacturers for assembly into new windows and doors are excluded from the scope of this study. Also excluded from this study are windows and doors for automobiles or other transportation equipment, cabinets, fencing gates, shower doors and bathroom stall doors, elevator doors, and pet doors. Molding and trim are excluded as well. Also excluded are separately sold replacement hardware not typically sold as part of the window or door unit, (e.g., door knobs, locks, door stops, garage door openers). However, the value of these products is included here when sold as part of an integrated new window or door unit. For the purposes of this study, windows and doors classified as “energy efficient” are products that meet current ENERGY STAR criteria. Engineered wood products include those manufactured from particleboard, plywood, medium density fiberboard (MDF), and laminated veneer lumber (LVL). The wood segment includes wood doors clad with metal or plastic materials, but which have a wood interior. Wood windows include only those products in which all the framing components (e.g., jambs, sills, stiles, rails, and mullions) are made of wood. The new residential and commercial markets include only those products installed in the construction of new residential and commercial structures. Improvement and repair markets encompass windows, doors, and related components sold to replace or repair existing products, or as part of a remodeling, renovation, or expansion project.